A simple visit to the library. Something we take for granted. Something so simple. Flashback to 50 years ago - such a visit was not so simple. 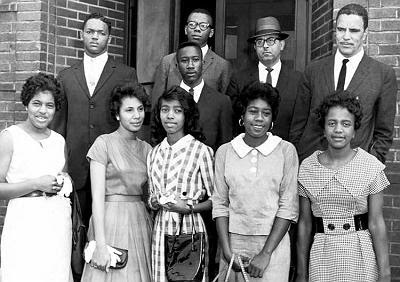 A major landmark in civil rights history will be celebrated this week. On July 17, 1960, Rev. Jesse Jackson and seven other determined students ventured into a "whites-only" public library and were thrust directly in to the work of civil rights activism. Rev. Jackson knew going in to the situation that staunch circumstances would result from trying to secure literature from the library, but he felt it was it was time to show opposition to the extreme injustice. Jackson stated it only took 15 minutes for authorities to arrive, handcuff and subsequently jail what we have come to know as The Greenville 8. Jackson tell the Sun Times, "All of us went for our own reasons. Many of us did not know each other. The '54 Brown vs. Board of Education decision had passed, and nothing had happened. That summer was a pregnant moment in time. A season of struggle had begun against legal segregation. We were pushing against the walls. On that day, we eight students went to jail fighting for our dignity." This week marks the 39th Annual Rainbow Push Conference where Rev. Jackson will honor The Greenville 8 among other civil activists. "What we knew as horizontal segregation is over. Today, it's vertical segregation," says Jackson. "We are a free but not equal society, and that's because of unenforced civil rights laws -- unenforced fair lending laws, unenforced fair housing laws, an unenforced Community Reinvestment Act. We need an urban policy." Get more information on The Rainbow Push Coalition and their 39th Annual Conference here.